An application schema defines the logical structure of geographic information and its semantics. In the context of the ISO 19100 set of standards, the primary means to do so is object-oriented modelling as described in UML, more specifically UML structure diagrams. 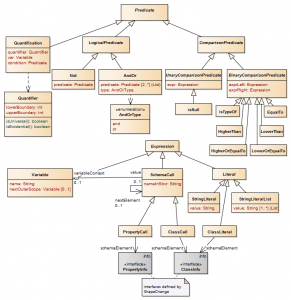 Some rules and conditions that apply to an object cannot be expressed via a UML diagram. They can be specified in textual form using so called constraints. Different languages exist to express constraints. They vary with respect to the degree of standardization, and the degree of formalization. ShapeChange supports a number of constraint languages. The following sections provide further information for each of them. These parameters can be used to specify for which types of model elements constraints shall be loaded, and if constraints should be loaded at all. They also control which types of constraints are generated. All constraints are expressed textually – involving more or less formalism depending upon the chosen constraint language. While documenting model elements, the feature catalogue target will include the textual representation of constraints defined and loaded for these elements. The standardized means to express constraints for application schema elements is OCL. It is a standard of the Object Management Group (OMG). ISO 19103 “identifies the combination of UML static structure diagrams with its associated Object Constraint Language […] as the conceptual schema language for specification of geographic information”. 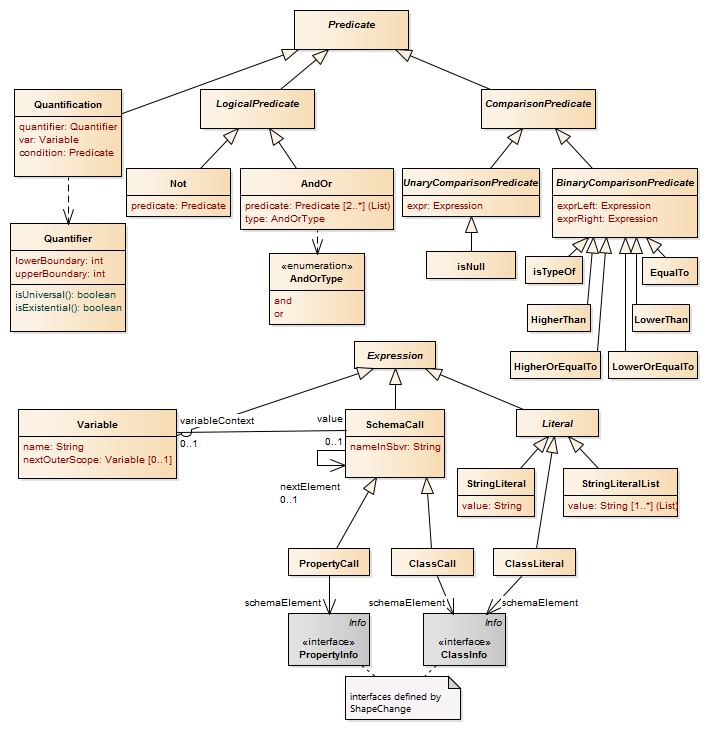 ShapeChange can parse OCL constraints that are defined in a schema. It supports the derivation of Schematron rules from OCL constraints. See the OCL Conversion to Schematron page for further information. The most simple way to express constraints is to use pure human readable text. It is not possible to automatically derive any artifacts (e.g. Schematron rules) from these constraints, because they do not follow a structural convention. However, they are a means to document model constraints, both in the UML model itself but also documentation derived from it (such as feature catalogues). Also, they can serve as a first step towards the definition of more formalized constraints (e.g. OCL). ShapeChange loads constraints as pure (human readable) text constraints whenever the type of a given constraint is unknown. OCL and FOL constraints can be loaded as text constraints (so without further parsing and thus also without the possibility to derive artifacts such as Schematron rules from them) when the according regex parameters in the input element of the ShapeChange configuration (oclConstraintTypeRegex and folConstraintTypeRegex) are set to the empty string. Within the OGC Testbed 11 constraints that were represented using structured english based on SBVR (Semantics of Business Vocabulary and Business Rules) have been loaded and parsed by ShapeChange, and ultimately translated to Schematron rules. While parsing the constraint text the constraint information has been translated into an intermediate language, the First Order Logic (FOL) language. This language is based on predicate expressions. The following figure provides an overview of the supported language constructs. FOL expressions can potentially be parsed from different sources. The currently supported source type is ‘SBVR’. To learn more about the supported SBVR grammar, see the OGC Testbed 11 Aviation – Guidance on Using SBVR Engineering Report. Schematron rules can be derived from FOL constraints using the FOL to Schematron target.